"It's when everyone thinks they know who you are, then you're trapped." IFC Films & Amazon Studios have debuted the trailer for an indie drama called Complete Unknown, from director Joshua Marston, starring Rachel Weisz and Michael Shannon. The film is a mystery about a man, played by Michael Shannon, planning to move to a new state with his wife for her graduate program. Just as he is about to do so, a woman from his past who often changes identities, played by Rachel Weisz, reenters his life at a birthday dinner party. The full cast includes Danny Glover, Kathy Bates, Condola Rashad and Chris Lowell. This originally premiered at Sundance this year but I don't recall hearing much buzz about it, at all. The mystery surrounding Weisz's character looks intriguing, but I'm not sure if the payoff will be worth it. 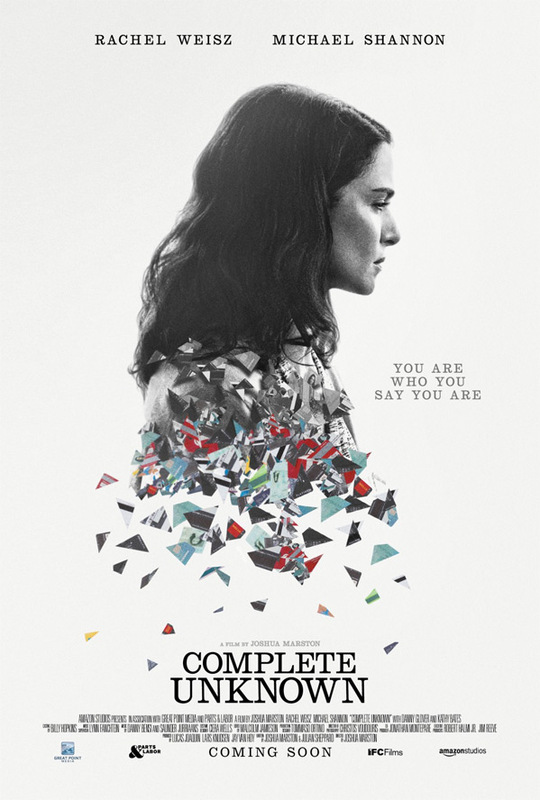 Complete Unknown is the first English language film from Joshua Marston and centers on Tom (Shannon) and a mysterious woman named Alice (Weisz). When Tom and his wife host a dinner party to celebrate his birthday, one of their guests brings a date named Alice. Tom is convinced he knows her even though she's going by a different name with a different biography, and she's not acknowledging she knows him. We soon find ourselves on an all-night odyssey with two characters, one needing to make a change in his life, the other questioning how to stop changing. Complete Unknown is directed by American filmmaker Joshua Marston (The Forgiveness of Blood). The screenplay is by Julian Sheppard and Joshua Marston. This first premiered at Sundance Film Festival earlier this year and also played at Karlovy Vary. Amazon & IFC Films will release Complete Unknown in select theaters starting August 26th this summer. Thoughts? Very nice cast, good drama that does not end with gun and beautiful Rachel Weisz (yeah, she's not the only one that's good in this). What's not to like? But what else should I do, Bo? I just say what I see or like. And I'm glad someone likes my way of saying it. As for the Rachel Wiesz, I can only repeat myself: what's not to like? Both actors are great. The film looks good from what we can see from the trailer. Weisz's accent is on POINT!!! Interesting. Films with a bit of mystery always capture my attention.